I’ve wanted to make mint jelly for the past few years, but never grew enough mint to make it happen. Mint is basically a tasty weed and takes over a garden, so I’ve never planted mine in the ground. Just in a small pot… and even though I have a green thumb in my garden, I have blacker than black thumb for potted plants. 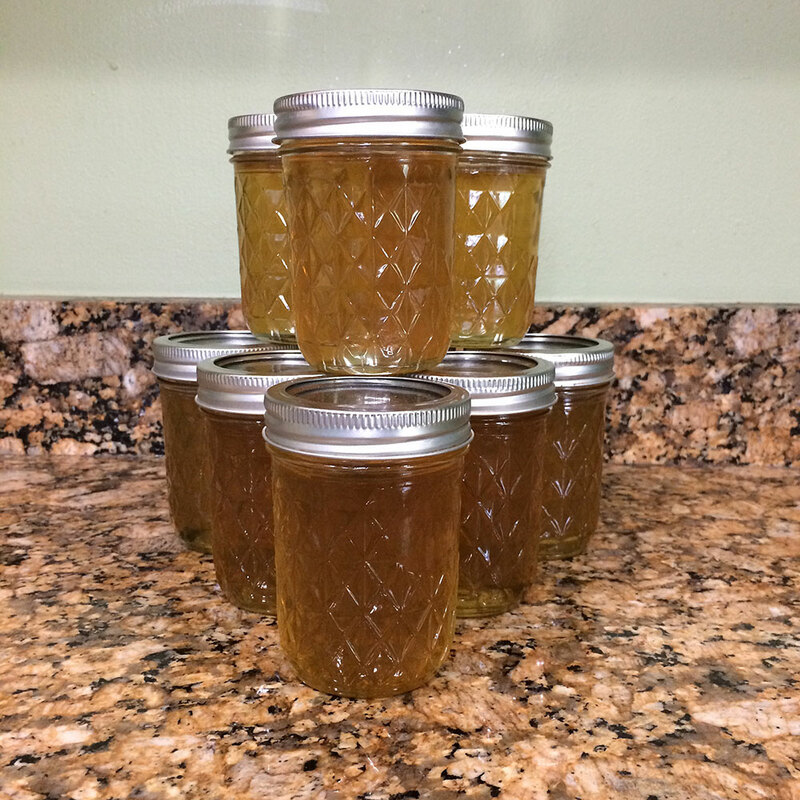 Lucky me, my neighbor offered me a bunch of hers this past weekend, so I got to try my hand at making some jelly! The recipe I followed was from my Ball recipe book — I highly recommend their home preserving book. It’s one of my favorites! (I get no money from the sale of this book, in case you care) — and I doubled it to make 9 jars instead of 4 or 5. After boiling the mint leaves in water for a bit, I poured the entire mixture into the jelly bag, which then separated the leaves from the mint water mixture. 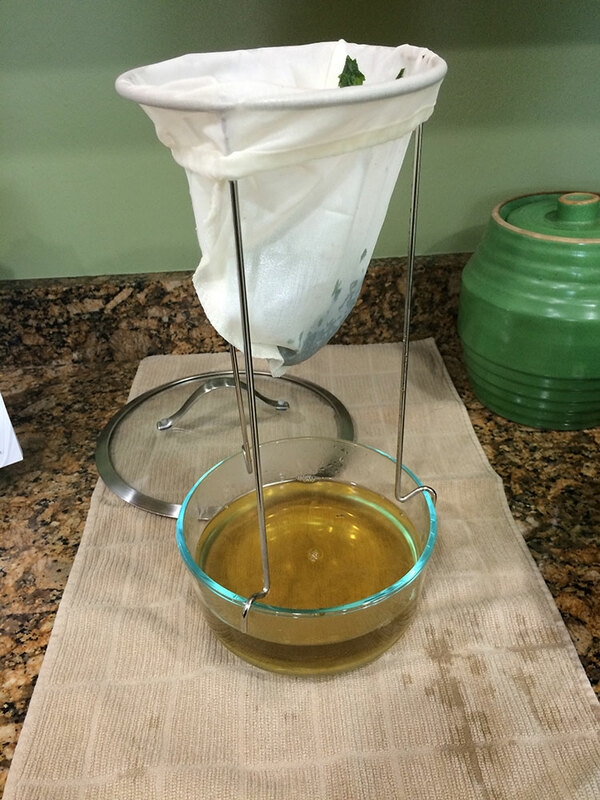 Once I got the amount I needed, I put it back into the pot and added in the sugar, lemon juice and liquid pectin. 1. Mint jelly is only green if you add food coloring. Otherwise, it’s a yellow-y color. 2. Even if you aren’t making a huge batch of jam or jelly, use a big pot! I have a stock pot, but opted for a smaller pot for this batch of jelly. HUGE mistake. The jelly bubbled over at one point and has permanently (or so it seems) stickied my stove. Joy. 3. Follow the recipe, even if your jelly isn’t super jelly-like when it is suggesting you take it off the heat. I have a hard time with this because in my mind it needs to be jelly before it is canned. But once your jelly cools and sits for a few days, it will gel up perfectly. If you over boil, it will be rubbery and gross. Listen to the experts — they know what they are talking about (mostly). By doubling my recipe, I was able to get nine jars of mint jelly. I got a text from my mom (my biggest jelly and jam fan) this morning saying how good the jelly was on her lamb dinner last night. Glad to have found another recipe that I like for canning. All in all, this took me about 2.5 hours from start to finish, start being taking out supplies and picking the mint, finish being clean-up and jar storage. Not bad. 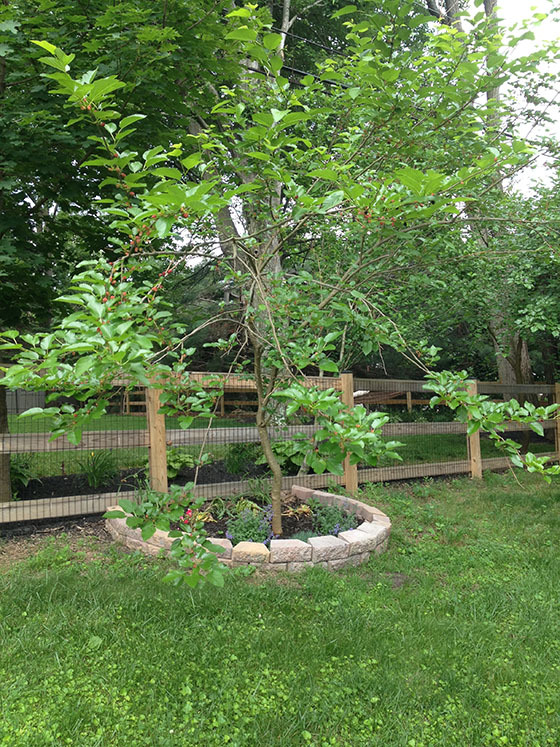 I saw a tree in our yard with berries on it when I was giving Brian his weekly tour of the garden. (He humors me and I love him for it). I was pretty excited when I noticed the berries — also surprised that I’d never noticed them before! So, even through Brian said they were probably poisonous, I did some research (thanks, Eddie!) 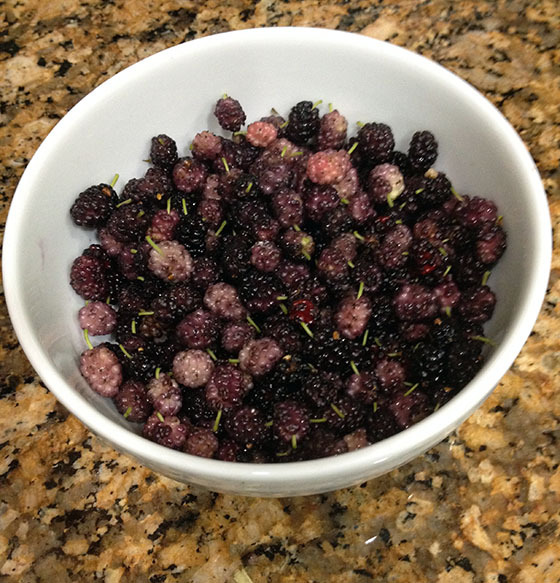 and discovered they were mulberries. You can imagine my delight when I realized that 1. the berries weren’t poisonous and 2. I had even more fruit growing in my yard! I quickly tried one and they were delicious. 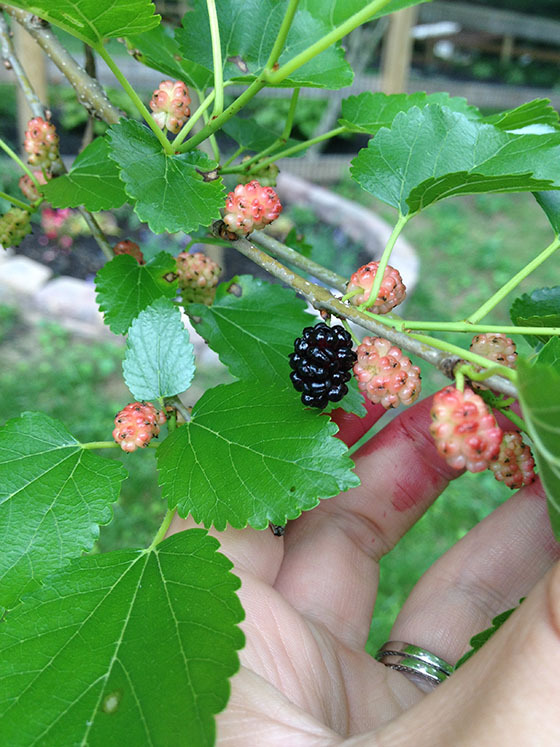 Mulberries taste similar to blackberries, just a little less sweet and tart. Over the course of the week I went out and picked the ripe berries (they turn black when they are ripe). 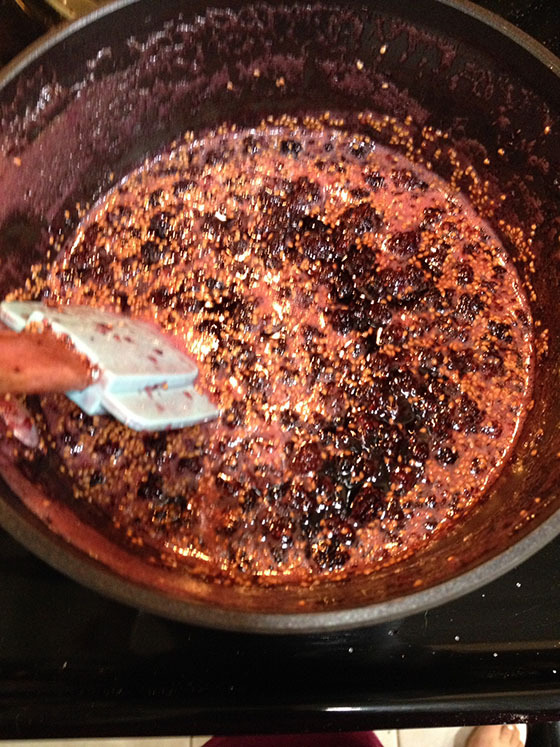 When I had enough berries, I started searching for a recipe for jam. I found a recipe that called for berries, sugar and lemon juice (no pectin) from Claire K Creations. I didn’t have quite as many berries as the recipes called for, but was able to tweak the measurements to work. First, I had to pull off the green stems. That only took half an hour haha. Then, I mashed them down a bit to release some of the berry juices. Even though I didn’t have enough berries, I saw that Claire uses equal parts sugar to berries, so I weighed my berries on my food scale and then weighed out the same amount in sugar. Then, I followed Claire’s instructions. First, I brought the berries to a boil. Then, I added the sugar and lemon juice. I let everything come to a boil before reducing the heat and allowing the jam to thicken. When the jam was finished, I opted to put it in small mason jars, but not to can them. Truth is I ran out of the lids to seal the jars properly. So I popped all of the jam in the fridge to cool and thicken even more. I used 320 ML of berries and got three small mason jars and one 1-cup tupperware of jam. Not bad for berries I didn’t even know I had growing in my yard! 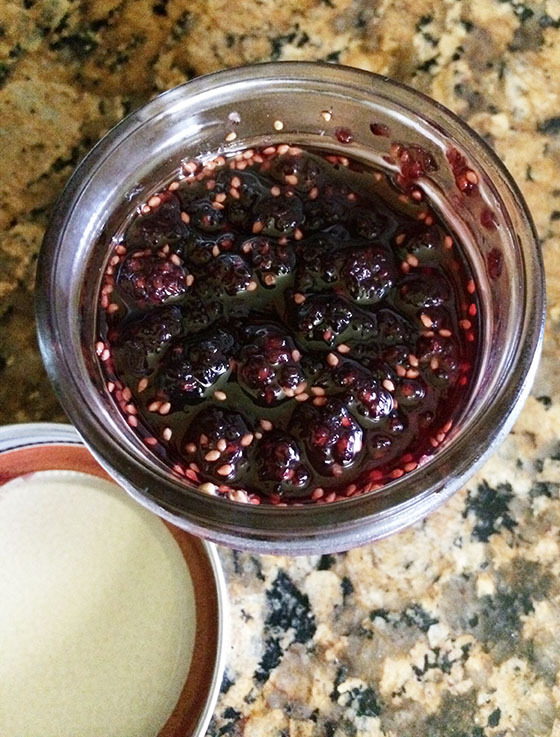 If you ever get the opportunity to make your own mulberry jam, not only is it super easy, it is also delicious. Make sure you check out Claire K’s Creations for other yummy recipes! 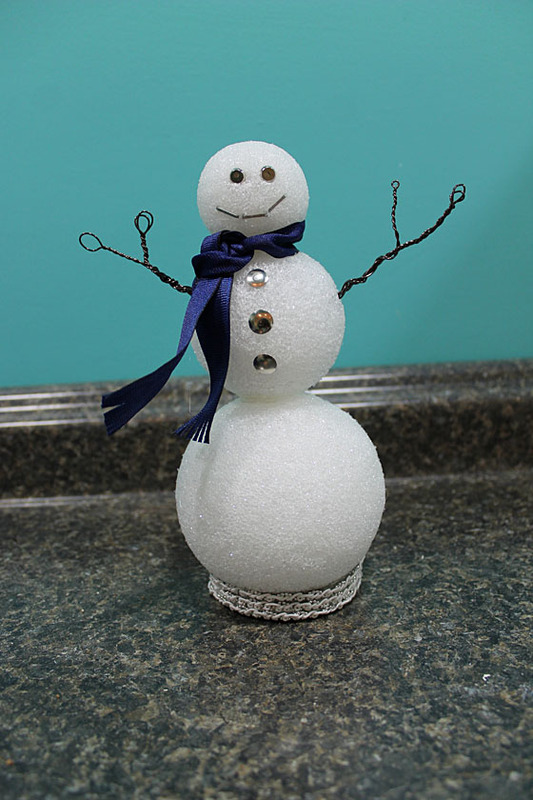 Do you know someone who loves snowmen? Or home improvement? If you do, then this decoration made mostly of home improvement findings would make a fabulous addition to their Christmas decor. Take the largest ball and stick a pencil in it. Weird, yes. 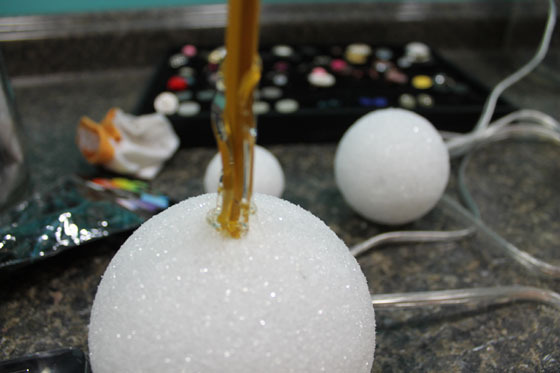 Cover two inches of the pencil in hot glue, then stick the medium-sized ball on top. Yes, there is a random sock on my craft table. Thank you, Remmy. Do the same thing for the smallest ball, but do not push the pencil all the way though. 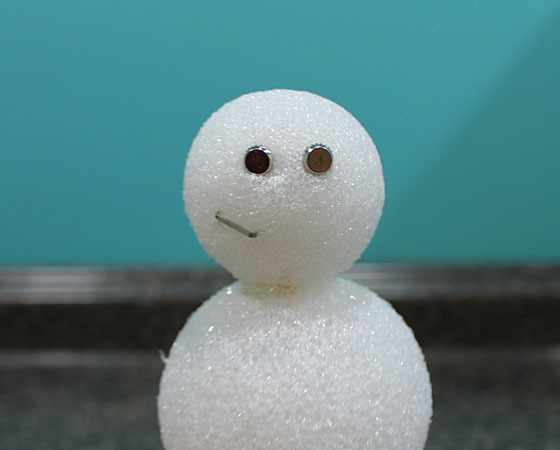 This is the head of the snowman. 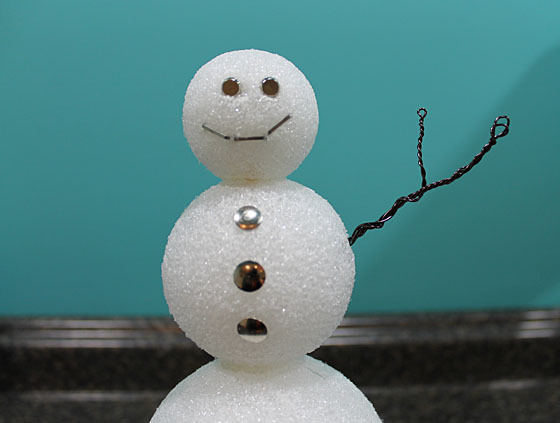 Make a face for your snowman using two nails and a few staples. Stick each component into the styrofoam to secure it. 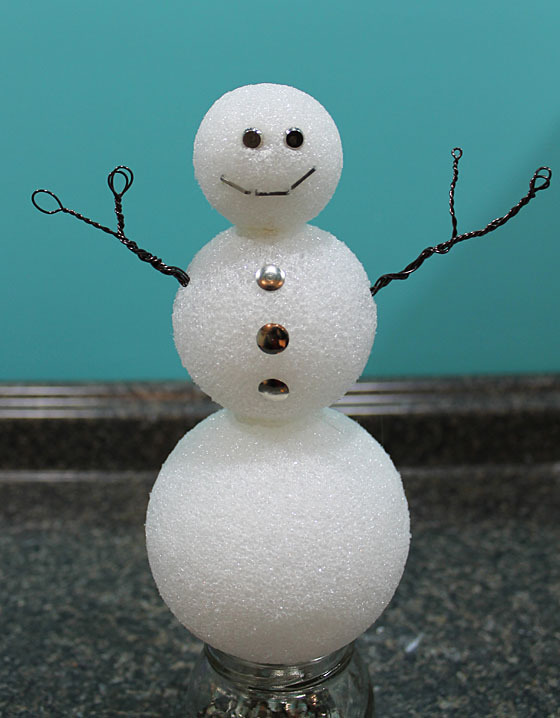 Once your snowman has a face, add a few tacks along its belly for buttons. Place a small dab of hot glue under each tack so they don’t come loose over time. 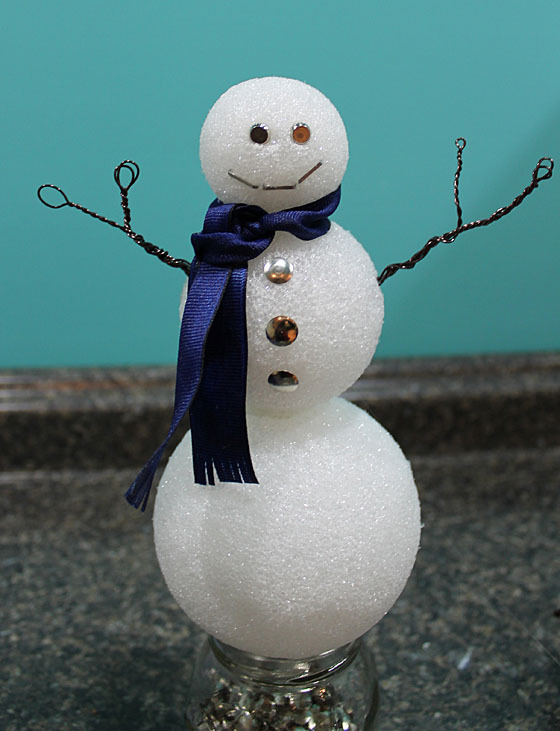 Make arms for your snowman out of wire. Twist the wire until you have two long pieces for arms. Stick the pointy ends into the styrofoam. Or better yet, find two twigs to do the job. Tie a piece of ribbon around the snowman’s neck. Cut the ends to the length you prefer, then “fray” the ends with tin scissor cuts. I added No Fray to mine. 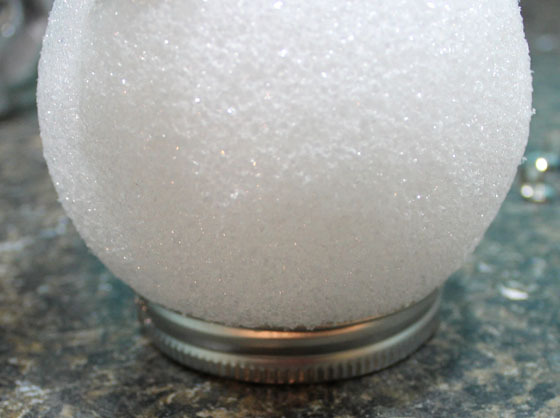 Take the mason jar band and line the rim with hot glue. 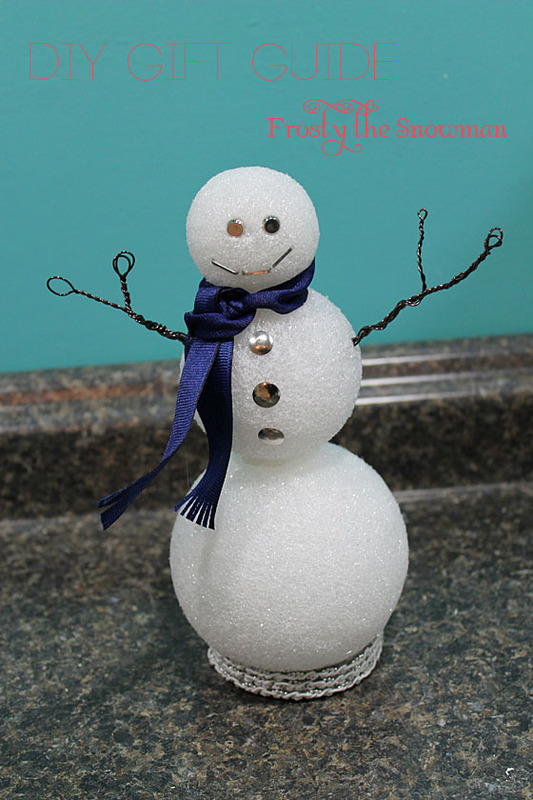 Press it onto the bottom ball to act as a stand for the snowman. Wrap ribbon around the band, securing it with hot glue. 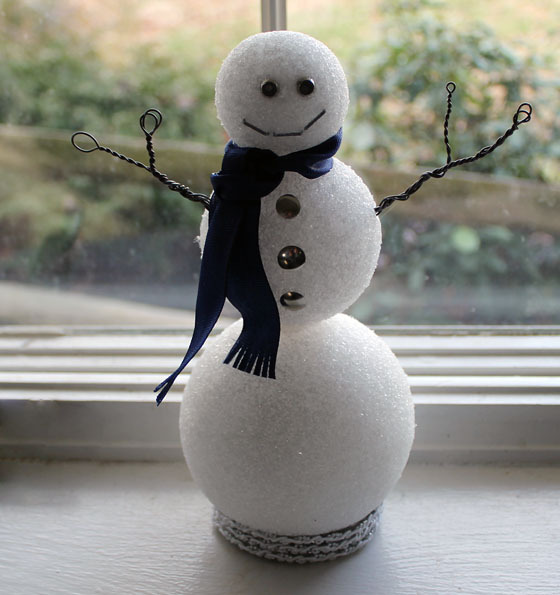 Our snowman is currently on the lookout for snow we are supposed to be getting today. Here’s hoping!